The business is known for its ice cream sandwiches and ice cream tacos, which are now served at the Providence storefront. Photo from Tricycle Ice Cream’s Facebook page. Tricycle Ice Cream opened its shop doors last weekend at 70 Battey Street in Providence (the former north Bakery location). 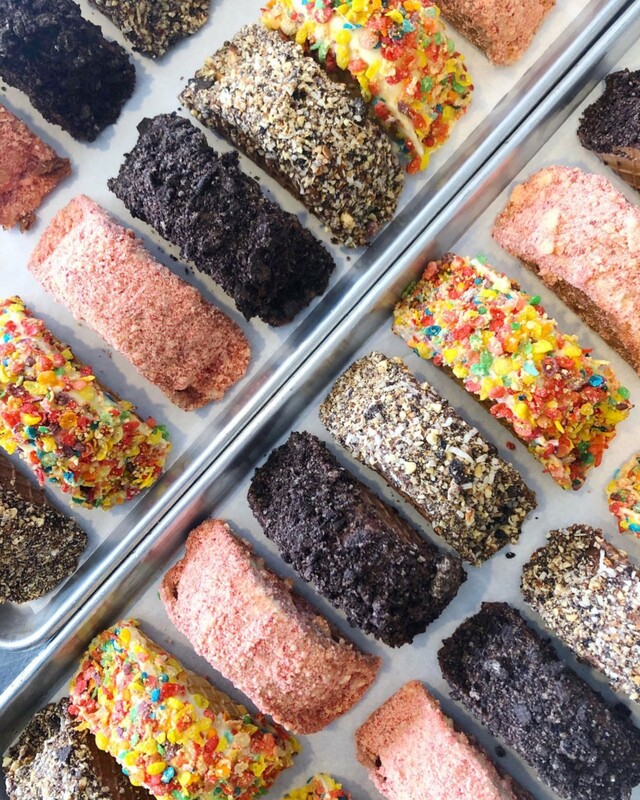 The business became famous for peddling ice cream sandwiches on freshly baked cookies at farmers markets and events around town since spring of 2014. 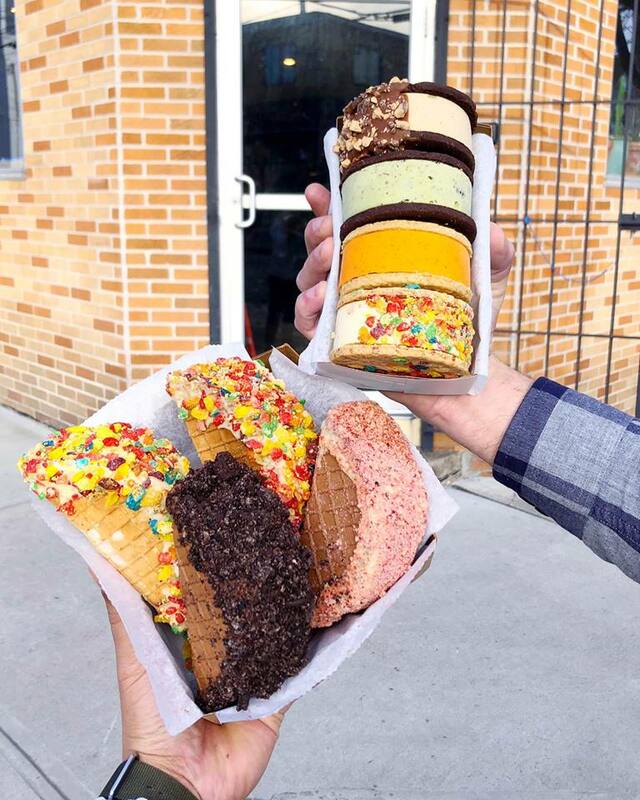 Now fans have a brick and mortar location to visit that sells the famous ice cream sandwiches alongside the newer ice cream tacos and sorbet pushpops. Opening menu ice cream sandwich flavors include Madagascar vanilla ice cream on espresso shortbread cookies; Oreo cookies and sweet cream ice cream on salted caramel drizzled Ghirardelli cocoa cookies; creamy peanut butter and chocolate chip ice cream on Ghirardelli cocoa cookies; fresh mint and chocolate chip ice cream on Ghirardelli cocoa cookies; Mocha and Valrhona chocolate chip ice cream on Cocoa Pebbles cookies; and caramelized Fruity Pebbles and sweet cream ice cream on Fruity Pebbles cookies. Ice cream taco flavors include fresh mint ice cream with Oreo cookie topping, chocolate dip and chocolate shell; caramelized Fruity Pebble ice cream with Fruity Pebbles topping, white chocolate dip and vanilla shell; Oreo cookies and sweet cream ice cream with strawberry and Madagascar vanilla crumble topping, chocolate dip and chocolate shell; peanut butter and chocolate chip ice cream with Oreo cookie topping, chocolate dip and chocolate shell; and Callebut chocolate ice cream and toasted almond coconut topping, chocolate dip and chocolate shell. Ice cream tacos. Photo from Tricycle Ice Cream’s Facebook page. There are a few specialty ice cream sandwich flavors including chocolate dipped and toffee-topped Dave’s Blind Pig ice cream on Ghirardelli cocoa cookies; white chocolate-dipped and toasted Frosted Flakes topped cereal milk ice cream on Cornflakes cookies; white chocolate-dipped and sprinkle-topped glazed doughnut ice cream on Madagascar vanilla cookies; Callebut chocolate ice cream on salted pretzel cookie; and Thai tea ice cream on toasted coconut shortbread cookies. Sorbet pushpops in mixed berry and passionfruit mimosa are also be available.